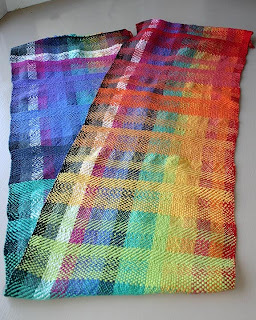 I'm spending the weekend in a weaving workshop at SCIART, making another color gamp (sampler). The last one (Ravelry link) took me 18 months to get off the loom due to constantly breaking threads and other problems; I basically abandoned it until I needed the loom for something else. This time around I'm using pastel colors, with 2 different variegated yarns on either end. The yarn is bamboo, 9 colors threaded at 16 ends (strands of yarn) per inch. I'm not a big pastel fan but since I already had a gamp with primary colors . . . 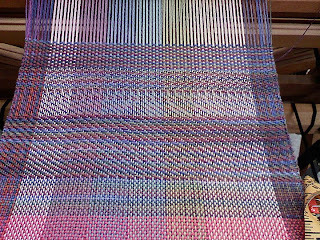 I wound the warp and threaded the reed Friday night, then started on the heddles after Guild today. It all went fairly well - as well as it can, I guess, when you discover after threading the entire thing that you skipped right over 16 threads smack in the middle of the pattern. Yeh. Not good. Had to unthread, move and then rethread 48 ends to make room so the pretty green ones could go in their proper place. 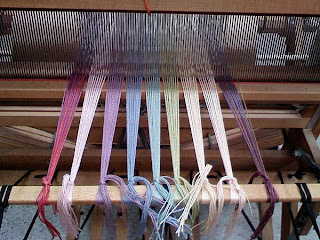 The first section is woven using the same yarn as the right side warp threads. The next part will be woven with yellow and then peach, as I work my way in 6" increments across the entire 9 colors. 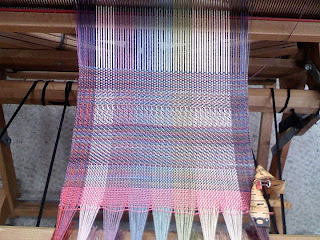 When done I'll have a great reference - 9 warp colors interlaced with 9 weft colors, each woven in 6 different patterns. And it's not going to take me 18 months this time. Should be off the loom tomorrow.